Then Tuesday saw the Quieter Neighbourhoods ‘design workshop’. This was for residents from a large residential area to tell the council how we want our neighbourhood to be more people-friendly, i.e. less dominated by speeding motor traffic. As it happened, the day before the meeting I noticed via Facebook that the Waltham Forest Mini-Holland bid had been voted through unanimously by the council. I looked up their plans via the very articulate Waltham Forest Cycle Campaign website, and because traffic engineering seems to be what gets me going these days (perhaps the menopause is approaching) it blew me away. Those crazy people in Waltham Forest have decided to create ‘villages’ out of three large residential areas in central Walthamstow by closing a large number of streets to any through traffic. Closing them! With bollards – planters – gates – or anything they can get their hands on, by the sound of it. On quieter roads, let cyclists and pedestrians through, but reduce motor traffic access and speed. Road closures, pedestrian/cycle areas and speed reduction on quiet, residential roads (especially when clustered to eliminate traffic just driving through an area without stopping) are cheap and brilliant ways to not only enable cyclists of all abilities to get around in a safe, calm environment, but also make where we live “Living Streets” where kids can play out, where neighbours can chat etc. This is why we believe the council should not be designing residential streets to encourage through traffic onto them. Can you imagine? Whole blocks of residential streets with no rat-running. Kids playing out in the sunshine, grannies chatting on the benches that would of course appear on pavements, flowers blooming in the wooden planters at the end of each street…basically world peace! The weird thing is that this has never occurred to any of us who have wrung our hands about rat-running and speeding and the lack of community on our streets. We’ve talked about closing our own road, because it’s such an extreme rat run right next to the town centre, but always with a sense of guilt – because of course it would just divert nuisance drivers onto neighbouring streets. It never occurred to us to take the stance that none of our residential streets should allow through traffic – close the lot, and keep all the traffic on the main roads. Of course, the instant objection is that wouldn’t that make for horribly congested main roads…? I guess the answer, in theory, is that with better cycle infrastructure – segregated cycle lanes on the main roads, and a network of quiet streets to cycle through – some of that traffic would simply evaporate. Each of the four groups fed back to the whole meeting. I’d raised the Waltham Forest ‘village’ model before our discussion at our tables, and in each group, it was the one thing no one could agree on. (Our group was the exception but I think I’d basically steamrollered everyone. Anadin Extra is powerful stuff, you know.) There was, however, complete unanimity about the desire to reduce through traffic and to reclaim the sense that we are a neighbourhood, not a route. I think those who baulked at closing roads were probably held back by what had stopped the idea occurring to us in the first place: that it’s not fair on the poor drivers. They have places to get to and mustn’t be delayed. I think somewhere at the back of our minds we have all been cowed into the notion that car is king. The term “ratrunning” is not meant to be anti-driving. Many of of us (including most cyclists) drive a car. And if it’s very convenient to drive 2km to school, or to the tube, it’s hardly surprising lots of people do it. But we have to recognise enabling and encouraging that behaviour isn’t helpful overall. We need a lot more people to get out of cars for short and unnecessary journeys…The aim of the schemes isn’t to force people out of cars, it’s simply to slightly rebalance the convenience of car driving for some journeys with walking and cycling. The result we hope is more people who don’t really need to drive getting out and about on foot or by bike, leaving more space on roads for those who genuinely need to drive. It’s a lovely idea, and I can dream. Keep at it, for slower speeds in residential areas, more cycling infrastructure. How long have you been car-free? Unfortnately i can’t claim complete freedom from the car Jean – i’ve drastically cut back on using it but several times a month i don’t seem to have any alternative, usually to give lifts to friends / children or to fit a lot of trips into one day. I’m about to blog about this. 30 years of being car free is impressive. Apologies for the very long comment. And thanks so much for your positive comments about the WFCC site! (I’m one of two “Council Liaison Officers” at Waltham Forest Cycling Campaign who have been most heavily involved in the mini-Holland schemes). 1. If you want to meet up, or for one or two WFCC folks to come across and explain what’s going on in Walthamstow to other north London groups – your residents’ association etc. – more than happy to arrange. Just get in touch! Can explain pros and cons, and realities of our approach and alternatives. Or, alternatively, the first “village” is due to be built by summer – come over and we’ll happily show people round! There is widespread evidence even without any “better cycle infrastructure” traffic rapidly settles back to its previous levels of congestion. We’ve seen similar networks of road closures in several European cities, as well as Hackney and other UK cities outside London – none have caused a traffic apocalypse. On top of that, according to everything we can work out – the congestion on the main roads wasn’t horrific during the trial period – which was only two weeks (a short enough period it is unlikely we saw any “evaporation”). The numbers of drivers ratrunning/passing through are tiny in comparison to the numbers already on the main roads – it’s a few percent. So it’s not massively noticeable in terms of congestion. Sure we had loads of people moaning on social media that the trial did cause huge delays on nearby main roads – but the council engineers believe that those delays were actually down to everyday problems that already bring our roads to a standstill fairly often – faulty lights at two junctions, a crash on the north circular, the Blackwall Tunnel being closed one afternoon, even too many lorries loading outside the nearby Tesco and McDonalds simultaneously (which delayed buses massively). We’ve seen locally, that there is sadly often an incredibly selfish attitude to things like road closures and even Controlled Parking Zones (CPZs) in the opposite way – people fighting to refuse them for others. We’ve seen streets with CPZs next to streets without, where people in the CPZ park their car on the non-CPZ street to avoid paying less than 100 quid a year – the result is, of course, the non-CPZ streets then fill up and are a nightmare for parking. 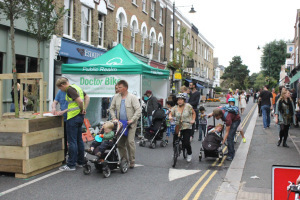 In the same vein, we saw in the consultation following the trial lots of people commenting and voting to close their street to through traffic, but keep other streets open – so they could get in and out of the area more easily. I believe an area-wide scheme is best – it solves all the problems at once. But it needs to be set up and handled in a way that residents get engaged in and understand the process – and see it altruistically and holistically. We haven’t even managed that yet in Walthamstow! For now, though, go ahead and fight for a road closure for your street selfishly! Perhaps it’ll show engineers and other locals what a difference it makes and what can be done. And if it pushes the problem somewhere else, that’s great ammunition to use on other streets and engineers – “look at how nice our street is now, we are no way losing our closure, but perhaps its time to shut out the through traffic on this entire area”. Of course, it also helps that road closures are very very cheap infrastructure – a few bollards or planters, a single gate. But I do think it’s vital engineers start to understand and use closures as an appropriate part of their “toolkit” – and that has to start somewhere – why not your street? Not entirely true – you can also close a street if it’s only a short distance to reverse before you get to somewhere to turn AFAIK, and a “turning circle” can be as simple as removing a few parking spaces just before the closure – which is something you’d want anyway so bicycles can cut through easily. A “point no entry” is essentially a tiny section of one-way – all of 5m or so at one end of a road. You can drive out of it, but because of the “no entry” signs, you can’t drive in. The rest of the street remains two way. That means traffic can enter and exit from one end, and exit from the other end. This, combined with the stuff about needing turning circles etc., in my opinion, is the sign of a traffic engineer who considers a closure too *radical* and is offering excuses. Sure, point no entries work – but they can often turn roads into de facto one ways – as through drivers simply learn to treat the road in that way. And one ways mean even faster car speeds, more collisions, more injuries, in general. A closure is a far superior solution for what you want – quiet, calm streets. To be clear, the “village” schemes are still hugely controversial in Walthamstow. Look at the statutory consultation responses, or the furore on social media. Many fear an apocalypse as a result of these schemes. Many more call them utterly futile etc. The scheme was pretty much universally judged before the trial even took place – on both sides. What I would say is that most people inside the trial area seemed to get it once it was in (hence the consultation being generally positive overall), and that most people in existing areas that have similar schemes – particularly Hackney – really like it once it’s in and wouldn’t consider removing the scheme. One thing you could do is arrange a trip to Hackney, or hell, get a bunch of residents to come over and see Walthamstow in six-nine months time! i) ‘What you actually need is cycling schemes on the main roads’ – absolutely, but we *also* need residential schemes so that people feel safe walking or cycling from their front door to local shops, the tube etc. – 50 percent of outer London car journeys are under 2km, 80 percent are under 5km. ii) ‘There are no collisions or speeding drivers in the area – you don’t need this’ – if so, why are there no parents cycling their kids to school? why do surveys of residents consistently put “traffic” as the biggest quality of life issue? why do no kids play in the street? iii) ‘Only a tiny minority of people cycle’ – ah, but many more would cycle if they felt able to – survey after survey says this. iv) ‘I won’t be able to drive onto my street/ I won’t get deliveries’ – yes you will, it’s just you won’t be able to drive through the area. Every street will be still accessible. It’s amazing how many people just don’t understand this point – despite being told it over and over. v) ‘It’ll take me 40 minutes instead of 3 minutes to get to my front door because of how I’ll have to get round – what about ambulances’ – well, gates with padlocks can be accessed by emergency services to get through closures if designed that way (bin lorries can also use these); but actually in Walthamstow, we found delays for residents were actually in the order of a couple of minutes at most, while emergency services were in favour of the scheme – because it was going to overall increase health, cut pollution etc. Dial-a-ride schemes also were in favour, and many elderly people liked the ability to cross their streets without panic/oncoming traffic. vi) ‘Why don’t you use one ways instead’ – One-ways actually speed up traffic flow, and some studies suggest increase collisions and injuries. One-ways don’t cut out through traffic – they simply funnel it and speed it up. Road closures are the single simplest way to cut out through traffic. vii) ‘The main roads will be horrific’ – we answered that one already above, in short, no they won’t. viii) ‘People have a right to drive on roads’/’Drivers pay for the roads’ – firstly, drivers don’t pay for roads, we all do; secondly, in most wards of Walthamstow, half of all households don’t have access to a car – why should everyone suffer because some drivers are selfish and won’t use the main roads for what they’re designed for, and thirdly, are we honestly saying things are great now? Think back to when we were kids – when we played out on local streets, when traffic fumes didn’t kill a huge number of children, before the obesity crisis threatened to derail the NHS – even discounting climate change, we can’t afford to just let cars continue to dominate our lives more and more. Many people find change difficult, many people are selfish – and don’t want to be inconvenienced as to where they personally drive or park, and many people see ‘cyclists’ as some weird outgroup. None of these are good reasons for opposing just about the only proven solution to these issues. Again, get a residents’ group to go walk around Hackney’s closures, or come and see ours in less than a year and let them talk to residents and see how it works in real life. Happy to put you in touch with Hackney, or get in touch w me for WFCC talk/walk! Final note, on streets with buses, bus cameras can be used to create closures for all other vehicles – that’s what’s planned on Orford Road in Walthamstow village. Thanks Simon for this, and no need to apologise for the length. I had no idea that Hackney had such a scheme and would love to visit it, as well as WF in due course. In the meantime it would be great to pick your brains. Up to my eyes in kids today but i’ll message you via Facebook soon if that’s okay! The area around De Beauvoir Square/Northchurch Road is probably the most famous Hackney scheme (actually asked for by residents initially). But also chunks around Millfields Road/Powerscroft Road and Shakespeare Walk are good examples in Hackney. And yes, pick brains away!